The trigeminal nerve is the main facial sensory nerve. 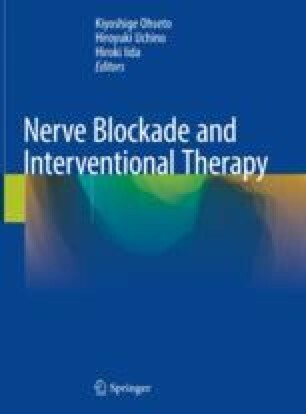 To treat the pain in the trigeminal nerve innervated region, drug solution (local anesthetic or neurolytic agent) is infused into the trigeminal ganglion (Gasserian ganglion) or peripheral branches, and radiofrequency thermocoagulation and pulsed radiofrequency are also applied to the treatment. There are trigeminal ganglion blocks (Gasserian ganglion block) and peripheral branch blocks: frontal (supraorbital) nerve block for the pain in the region innervated by the first branch, maxillary and infraorbital nerve blocks for the pain in the region innervated by the second branch, and mandibular, auriculotemporal, and mental nerve blocks for the pain in the region innervated by the third branch. There is also a method injecting anhydrous glycerol or pure ethanol into the trigeminal cistern.